Dr. Meyers was one of the first cosmetic surgeons in Colorado to provide Laser Resurfacing with a CO2 laser in 1995, and is very excited to offer the “gold standard” of care in Fractional CO2 treatments utilizing the CO2RE Laser. The CO2RE Laser is more versatile and less painful than other lasers. It offers patented variable depth technology allowing for superficial, medium and deep treatments, as well as simultaneous treatment at BOTH superficial and deep levels. Superficial and medium treatments provide for soothing, while the deeper treatments penetrate into the dermis stimulating collagen production, resulting in long-term tightening. Due to its versatility, the CO2RE Laser is even used to help treat thickened scars. CO2RE Laser treatments can be performed on virtually any part of the body to provide for soothing, tightening and evening of skin tones. Fractionated CO2 laser resurfacing allows for faster recovery and treatment of darker skin colors compared to standard laser resurfacing. The versatility of the CO2RE Laser allows for a range of treatment offerings based on the patient’s goals — superficial treatments utilizing just numbing creams — medium and deeper treatments utilizing numbing creams and mild sedation — and complete laser resurfacing with moderate sedation. Recovery times range from 5 to 10 days depending on the depth of the treatment. 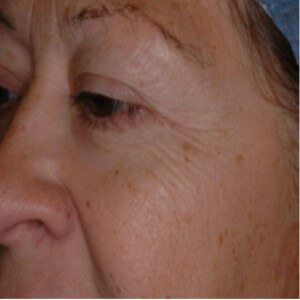 For those patients with a light skin tone desiring maximum results, the CO2RE Laser can be used to provide for complete resurfacing.